A loan of $1,000 helped to buy grocery products for the store. Primrose is a 26-year-old entrepreneur who lives with her husband and their two children in Hurungwe District in Zimbabwe. She currently sells groceries at the local marketplace. With her first Kiva loan, she expanded her poultry project to house more chickens with a larger run. She used the profit she earned to pay fees for her child and to pay the fees required for supplementing her failed 'O' level subjects with other classes. 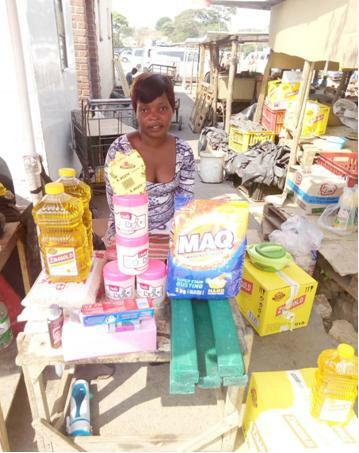 She is now requesting a second loan to diversify her business by expanding her grocery business, introducing cooking oils and produce. She plans to use the profit she earns to go to college and buy better clothes and food for her family. Primrose will repay the ‘social interest’ on her second loan by volunteering 2.5 hours per week as a CAMFED Learner Guide, facilitating classes from CAMFED’s ‘My Better World’ program with students at her local secondary school, helping to build children’s self-esteem and motivating them to remain in school. The Campaign for Female Education (Camfed) is an international nonprofit organization operating in five countries in Africa that focuses on eradicating poverty in rural Africa by investing in education for girls and supporting the economic self-reliance and leadership of young women. Camfed provides support for the long-term, working with individuals from primary to high school, and through the Cama empowerment and community outreach group. Kiva lenders’ funds are used to link women living in rural Zimbabwe to the capital they need to expand their businesses, support their families and contribute to their communities. Loans associated with this partner may carry a higher level of risk due to the macroeconomic situation in Zimbabwe. The Zimbabwean government released a bond note at a stated rate equivalent to 1 USD. However, the bond isn't trading at this rate in Zimbabwe and hence there's a risk of hyperinflation in the market. While borrowers may be affected by this macroeconomic risk, this partner is working to help mitigate risks by lending in USD and transacting with its borrowers electronically using mobile money. Like Kiva, Camfed focuses on empowering women and expanding opportunity for the world’s poor. The organization is tackling poverty by helping girls attend school and receive the support they need to excel academically, emotionally and professionally. Graduates of Camfed’s programs have gone on to safe, economically-independent and successful futures -- and have also prioritized investing in their communities and helping younger girls follow in their footsteps. Kiva is very excited about the partnership with Camfed and the opportunity to help its alumni start and grow small businesses.